On Saturday my friends biked the coastal track to the Pencarrow lighthouse while I walked the shoreline and tried to find photographs in the hard, contrasty light of early afternoon. After spending some time photographing a hauled-out fur seal, a group of little shags, a moth under a small lump of rata driftwood, and a fragment of wave-polished paua shell, I saw these two variable oystercatchers preening just above the water's edge on the shingle beach. I put my bag down, changed lenses, and crept a little closer, gradually and carefully. I didn't want to disturb them, so lay down on the shingle and began to photograph. They seemed unperturbed, so I wriggled a little closer. The almost impossible light — overhead and casting harsh shadows — and the black plumage and bright stones and sea left me wondering why I was even attempting to photograph. Sometimes, though, the only options are to do what you can or to give up and guarantee failure. I chose the former. That light creates a slight illusion of a two-headed bird. Not enough to entirely convince, but enough to force alternating focus. A pleasant confusion. 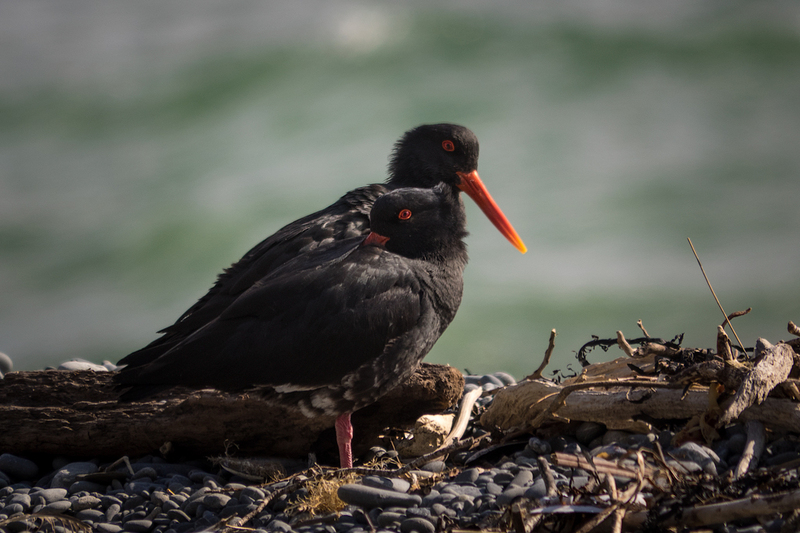 Zhoen, a photograph of a two-headed oystercatcher — now that would surely get the hit-counter going. A two-headed one-legged oystercatcher, actually. RR, that would be an even more bizarre photograph! I've seen one-legged gulls (and I don't mean the leg-tucked-up sort), but so far all the oystercatchers I've seen have managed to keep both legs intact.